I mentioned being impressed with Jim Homoki's scrap steel gondola loads earlier. When I saw them in Collinsville last year I was impressed by the look but, intimidated by how tedious they seemed to construct. I finally came up with a simplified approach that looks good and suits my style of building. 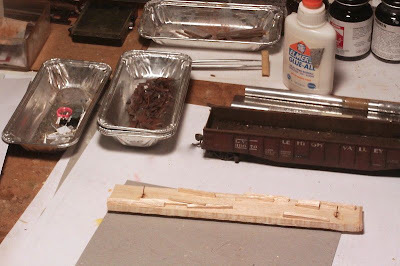 I trimmed a 1/4" piece of balsa to fit into an Athearn 52' gondola. The trimmed shavings are glued to the top to start adding a 3-D look. 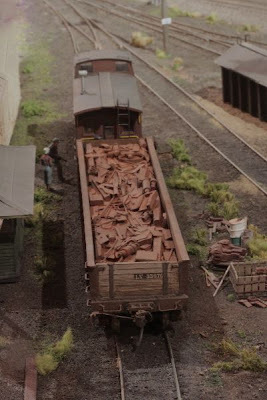 Becasue the finished load will not take to much handling I added loops of wire through the balsa toward each end (I do this on loads for coal hoppers as well) Removal can then be done using a tweezers. Small rectangles in varing sizes are cut from an old photo print. 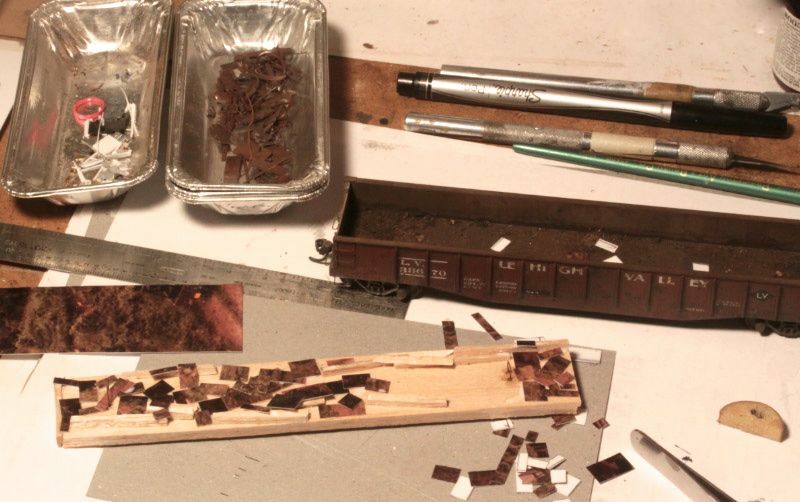 The resulting pieces are glued ramdomly onto the balsa sub-base. 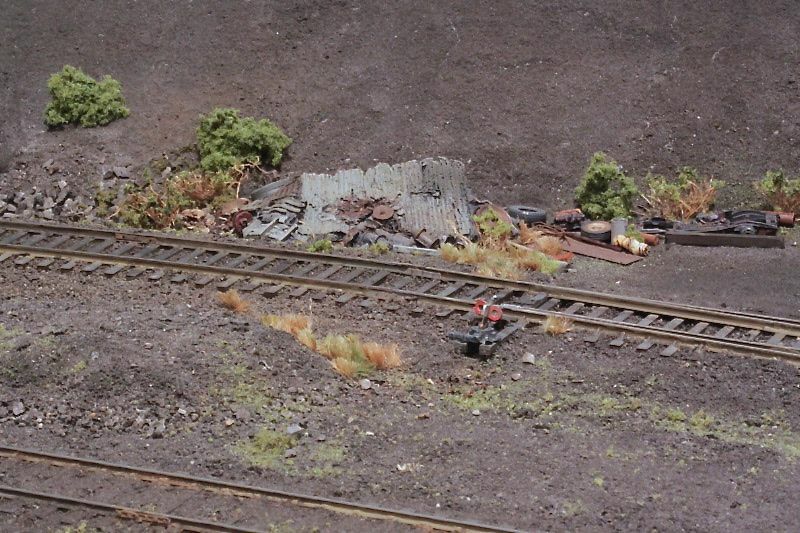 When I was satisfied with the look of things, I painted it with random mixes of weathered black, roof brown and tuscan. When the paint was dry I added bits and pieces of "super-detail" I had lots left over from my experience in mine site clutter. 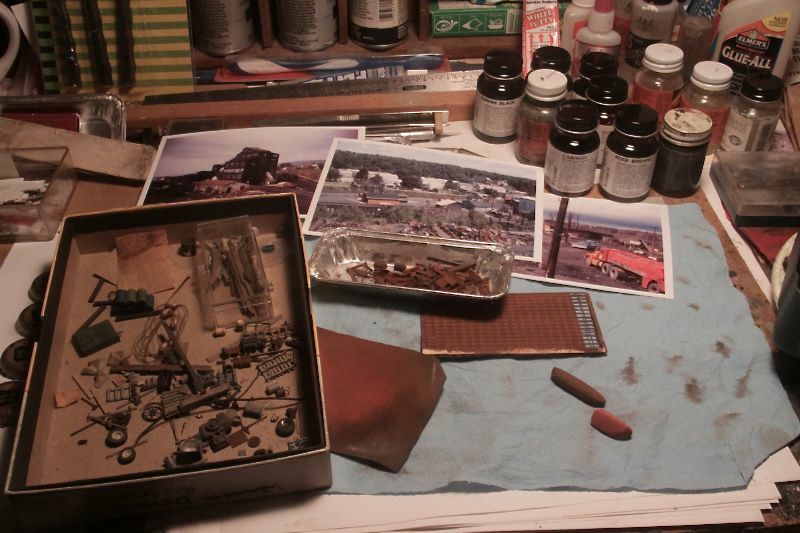 There are small unused parts from old kits, bits of sprue, scraps from scratchbuilding projects. various gauges and lengths of wire, etc. I think I added, at most, 100 of these bits. The weight/density of the load dictates the car won't be loaded too high. I kept it about 2' below the top chord. If you attempt adding dents to the side panels on the car, work from the inside and keep the top chord straight. In adding some variation to the shades of rust, I used chalks. Keep things SUBTLE. Oh, the time involved? I spent about 3 hours plus some additional fiddle time. In the world of railroading, we all know it is wiser to never say never, when the subject of special moves and locomotives come up in conversation. 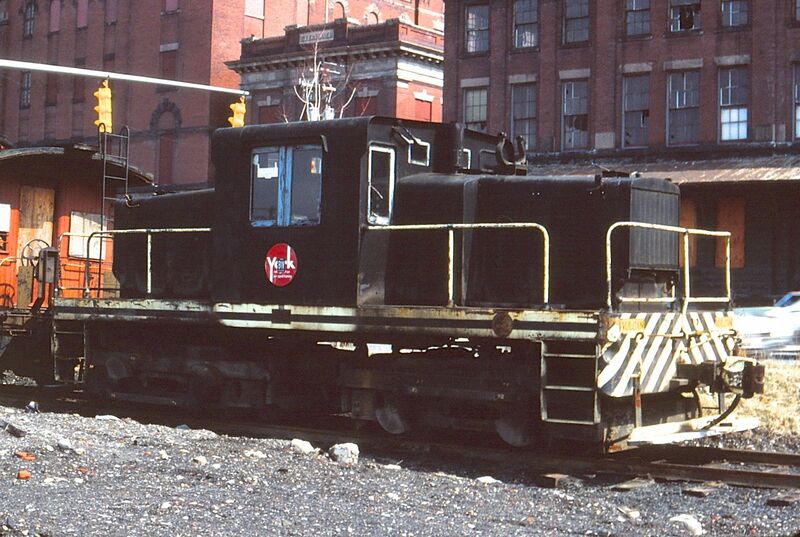 Norfolk Southern's Heritage fleet being an obvious example. Who would have thought the unit coal train to the power station in Bow, NH would rate the NKP unit? Certainly not I. Even more difficult to believe is seeing the Monongahela Heritage Unit entering New England on Pan Am/NS MOAY as trailing unit! A quick check with Brian Jennison confirmed the departure time for AYMO the next day to be around 13:30, (thanks Brian!) 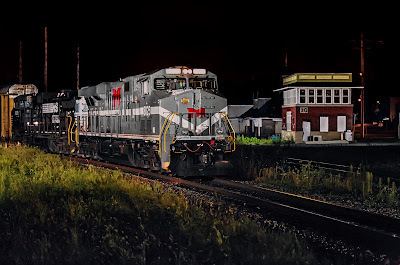 leaving me with an excellent chance to shoot NS 8025 leading past Mechanicville’s XO Tower overnight. Postings on the web late the next afternoon confirmed the engine to be leading........... I charged up the flash units and headed on down the road. Two hours and forty five minutes later I arrived, skipping any stops for breakfast enroute, concluding that I, like the majority of Americans, can skip a meal now and then and comfortably function. Quickly setting up with no idea where AYMO was, a BNSF loaded Unit Oil Train bound for Saint John, NB, slowly pulled out of Mechanicville Yard and headed east. The Dispatcher comes on to tell the crew they are meeting two at Hoosick Falls. I conclude one of these to be AYMO. This won’t be too bad I think time wise. Then it takes the BNSF Oil Train one hour and twenty minutes to run over to Hoosick Falls. AYMO with the NS 8025 exits the passing siding behind EDMO, and I’m not getting good images in my head. LOL! EDMO passes by the camera at 01:56, and after the trains passing the signals stay red. Not good. After an hour of silence, the Pan Am Dispatcher rings up AYMO, giving the crew permission to head west from a location I heard as “Schol”. Oh My Gawd! They were parked out there somewhere? Ninety minutes later the train is around the curve and out of sight from me! I can hear the air compressors for cryin’ out loud! But stopped! The signal stays red as a Canadian Pacific loaded unit train of oil or ethanol roars through the location heading for Kenwood Yard. The minutes pass by and then...............the signal turns green for westbound Pan Am traffic! I am thinking, one shot makes the night! Ha,ha,ha! This one right here! The crossing signals are activated and I can hear the engineer loading up the GE’s before he blows for the crossing. I fire off an awareness flash and the engineer shuts off the ditch lights for me. Around the curve and into position comes the NS 8025, it’s “way too bright” number boards giving it away. Wouldn’t you think the folks at General Electric would have realized? Well, never mind. 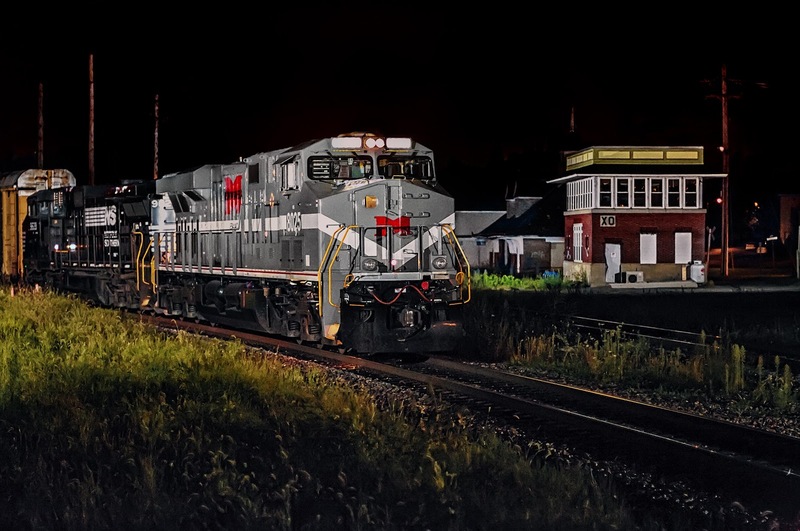 The second NS Heritage Unit to visit New England rolls into position, the lighting does its fantastic job, and the image is happily captured! 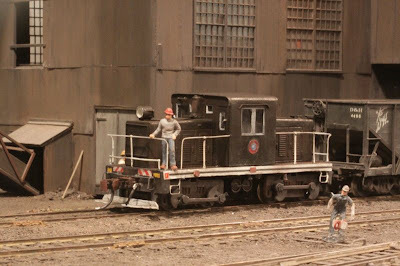 I give a wave to the engineer as the cab passes by. This was one of the longer stake outs I have done waiting, six and a half hours after I arrive...........AYMO pulls by me. However.........success and the joy that comes with it at night is a rich and rewarding combination, and I was smiling all the way back north to the compound! Shot on September 11, 2012 at 03:44 with the 5D and Mamiya 645 format 80/1.9 lens set at f1.9 in Mechanicville, NY. Please enjoy! Comments are welcomed. All the previous "Inch" chapters have dealt with accurately observing the scenic aspects of the world I model and duplicating them as faithfully as possible. This time I'd like to present something a bit different; My just completed model of a Vulcan 45T side-rod diesel. 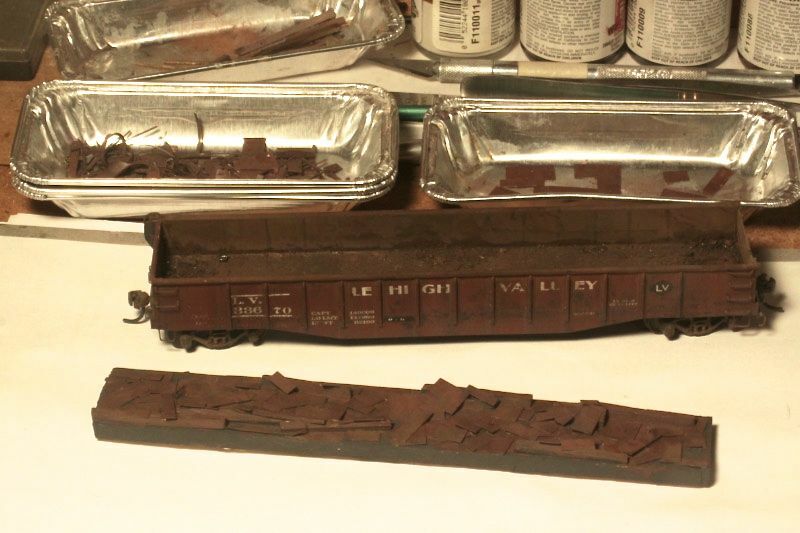 There was I time I was doing a lot more locomotive building but, with time, I've reached a saturation point. It now seems like I come up with these little projects only once every few years. I won't get into all the factors that tipped me to building this model but, I will admit there is a bit of personal history involving Vulcan. I grew up within easy walking distance of the Vulcan factory in Wilkes-Barre, my aunt and uncle Shaffer lived within sight of the plant and my grand-father Sittner worked at Vulcan for a while in the drafting department. My model is based on a prototype that resided as a display at the CNJ Station Resturant complex in Wilkes Barre. (picture provided) I only took a few slides and never did make any measurements. I also include an image from the 1940 Vulcan catalog. Vulcan didn't build many diesels. Records vary but, from 1938-1954 only 51 or 54 (depending on source)were built from 25T to 70T in size. Vulcan advertized that they built to suit a customers individual needs. This meant most were one-off's. With little in the way of standardization Vulcan was an extremely minor player in the manufacture of, even small, diesels. 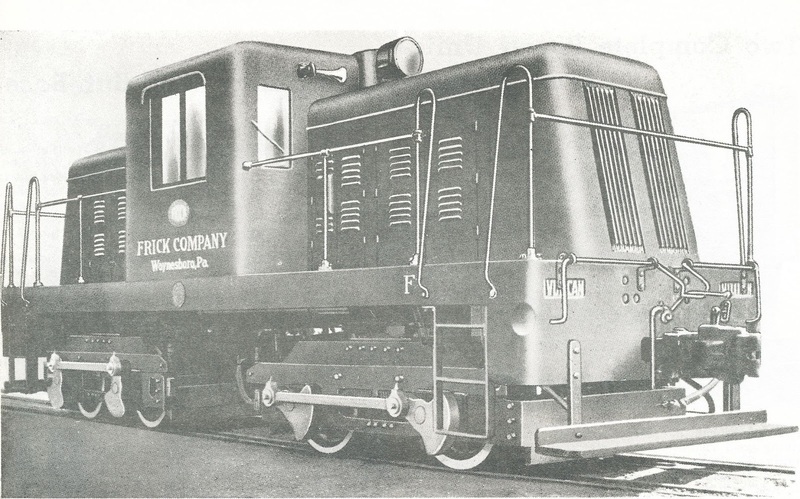 While many Vulcan steam locomotives and electric motors were employed in the mining of anthracite I don't know of any diesels that were used. My model is strictly a "what if" some independent had one. 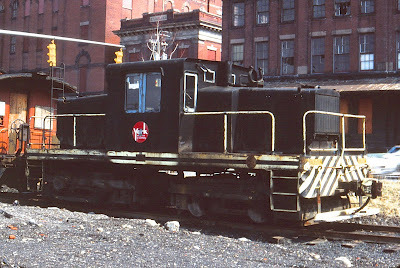 The purposely indistinguishable logo on the cab is for my Glen Dale Coal Co. 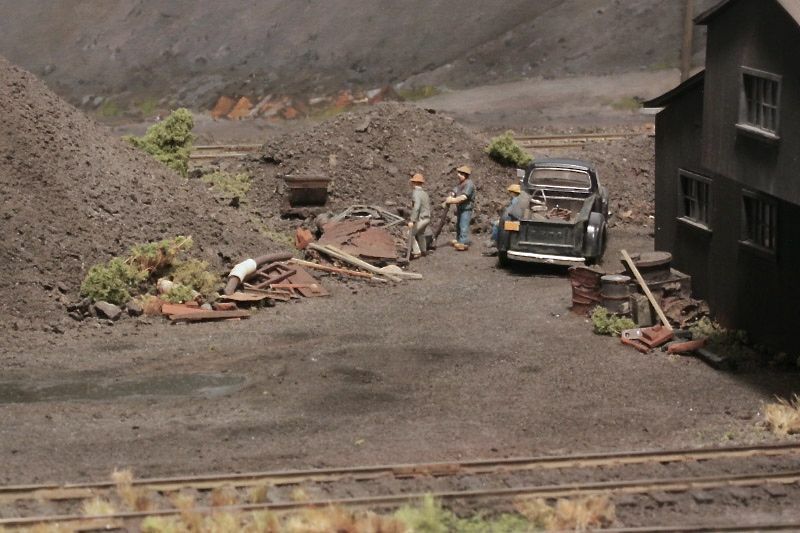 I provide pictures of the finished model working the breaker and passing the miners "patch". The model is built on a Bachmann GE 45T mechanism. Without drawings, and working only from my pictures, this is as close to prototype as I could manage but, not a dead ringer. An artists license! 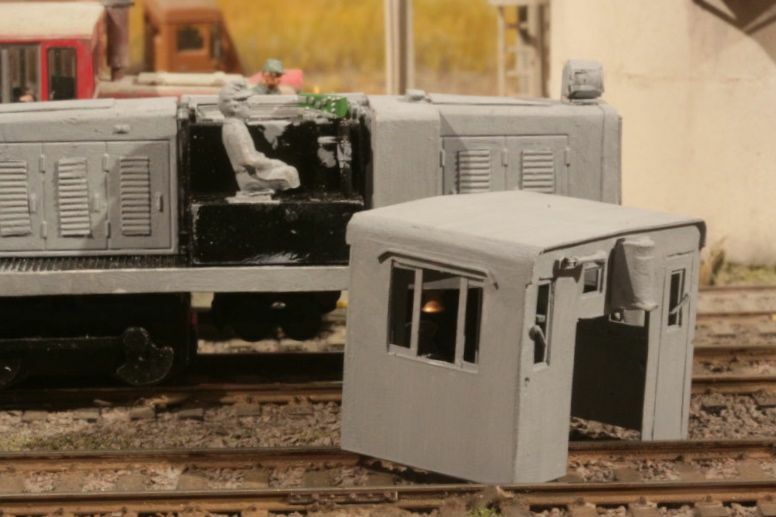 Even though it has the same basic profile as the Bachmann GE, everything above the trucks has either been rebuilt or scratchbuilt. I include two in progress images for comparison. Time involved was about 30 hours! Possibly the first thing that crossed your mind is the fact that I haven't been sending these "inches" of late. 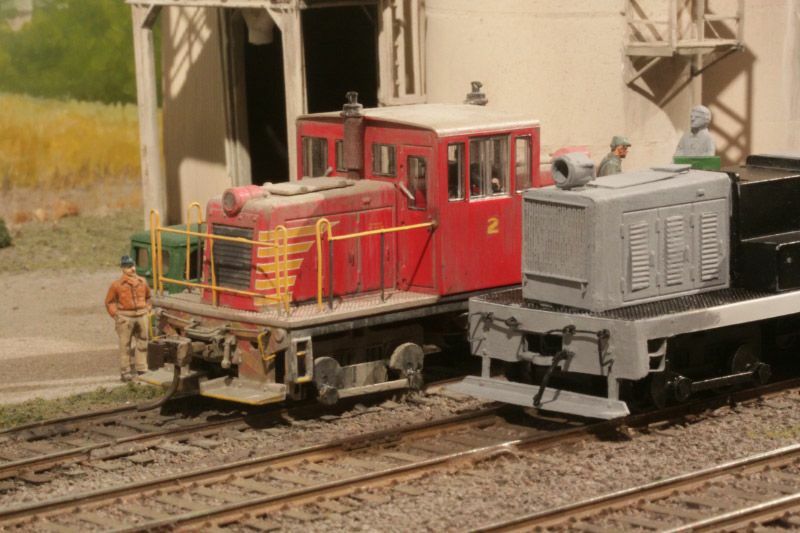 Number 9 came out in November and, while I've done some modeling since, nothing more had been added to the layout. 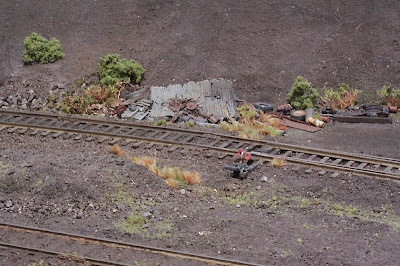 As I mentioned last week with "Iceberg" chap 14 which was also devoted to mine site clutter. I got inspired. 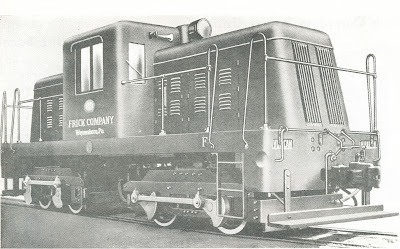 Even though I enjoyed a lot of the pictures in "Anthracite Railroads and Mining Vol. II. I based all the modeling work on photos I'd taken myself. Many of my slides were taken at the same locations shown in the book. (just a few years later) Case in point: My photo at Jeddo Highland #7 (8-86) where I showed and described a small mountain of "detritus" is a scene that appeared on page 24 of Chuck's book. The photo Chuck chose to use was taken by Bernie Perch in 1-74 from the same vantage point. One of the things that should be mentioned is how the formation of OSHA in 1970 and MSHA* in 1978 changed the visual scene at any extractive industy (quarry's mines, etc. 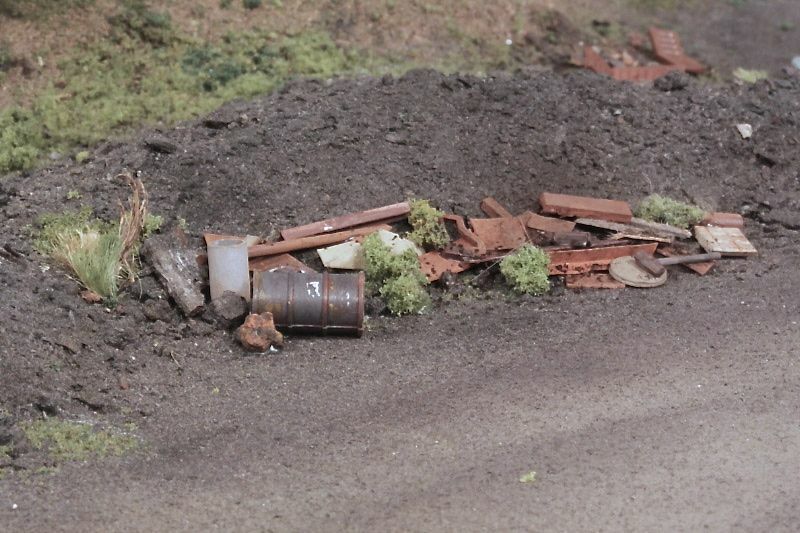 Everything got cleaned up under threat of heavy fines! Trust me I speak from first hand knowledge. Modeling a prototype with a time frame in the 21st century can be a lot easier, though less visually interesting. 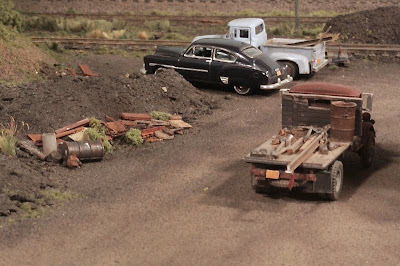 As for modeling the "clutter": There's commercially available "junk" from many companies, notably Woodland Scenics and SSLtd. I think one could break the "hobby" bank going that route and you'd still need all kinds of rusted scrap metal, old boards and timbers and a miriad of other things. 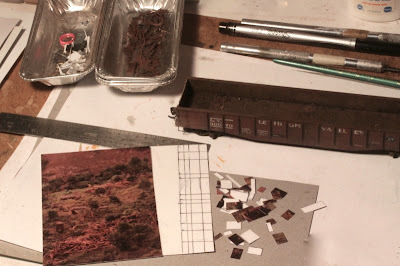 The approach I took was to use selected pieces of old sprue material, scraps of styrene left over from scratchbuilding and a wealth of other ersatz things that looked like they'd been "something". If it seems like a mindnumbing proposition to select, cut-up and paint individual pieces, I only made up a few hundred over a spread out period of time. Last year (2011) Jim Homoki (on this contacts list) showed a 52' gondola load of scrap made the same way at Collinsville. What a standout! Except for the 55 gal. drum (Revell) and the sledge hammer (SSLtd) everything was just from the scrap box. Don't forget this stuff can make great loads for trucks. Based on the Jeddo Highland #7 prototype scene from 8-86. Try for some variety in color, size and texture. 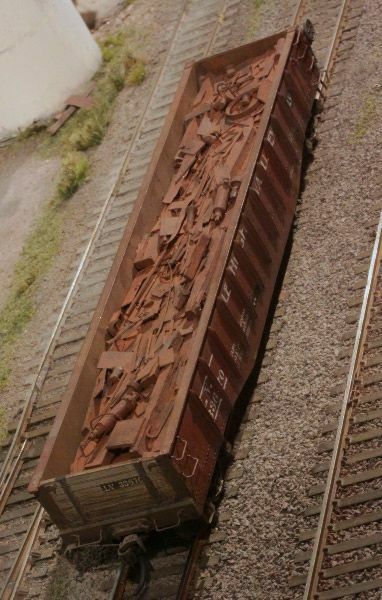 Not everything is rusted metal. These little chapters are always informal and freely shared. My contacts list is limited. If you know of others that may like this material please forward.